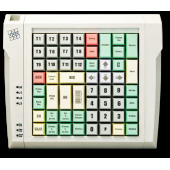 Keyboard with keyswitch modules	There are 9 products. 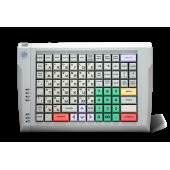 POS-keyboards are an excellent solution for automating processes in self-service stores and retail stores. 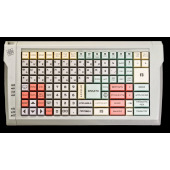 That is why LPOS-keyboard is widely used in self-service stores, grocery stores, household appliance stores, clothing stores, building materials stores, jewelry stores, as well as with service tables such as hotels, gambling halls, restaurants, etc. 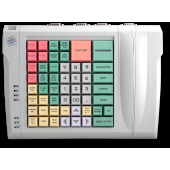 You can choose the most suitable set of parameters: interface (PS / 2, USB, RS232, RS485), magnetic card reader (2 or 3 tracks) and access type (electromechanical key, i-Button touch key or fingerprint). Сlick resources - more than 50 million. 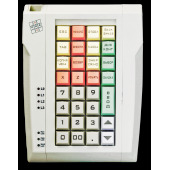 This is made possible by using Cherry buttons designed for intensive professional use. A button mechanism using gold contacts is used in switching devices with higher performance requirements. 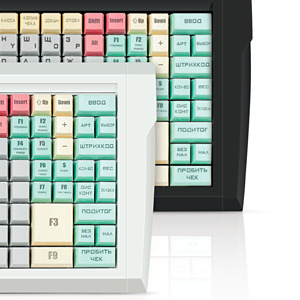 The reliability of such buttons is several times higher than those of conventional home keyboards. The equipment after installation does not require maintenance throughout its service life. Colorful caps and lids with laser engraving available for a batch of 50 LPOS-032 keyboards with pre-approval of the layout.Colors of caps: - light gray (RAL 9002); - white; - light green; - Pink; - pastel yellow; - Pastel purple. Colorful caps and lids with laser engraving available for a batch of 50 LPOS-064 keyboards with pre-approval of the layout.Colors of caps: - light gray (RAL 9002); - white; - light green; - Pink; - pastel yellow; - Pastel purple. Colorful caps and lids with laser engraving available for a batch of 50 LPOS-096 keyboards with pre-approval of the layout.Colors of caps: - light gray (RAL 9002); - white; - light green; - Pink; - pastel yellow; - Pastel purple. 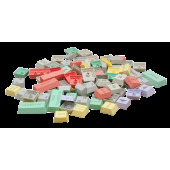 Colorful caps and lids with laser engraving available for a batch of 50 LPOS-128 keyboards with pre-approval of the layout.Colors of caps: - light gray (RAL 9002); - white; - light green; - Pink; - pastel yellow; - Pastel purple.